My mom made this delicious dish last time she was here and aside from loving all the ingredients, I think it makes a perfect side to any summertime barbecue! While it can be eaten with chips, I prefer mine straight up. All of these ingredients can be adjusted to taste. 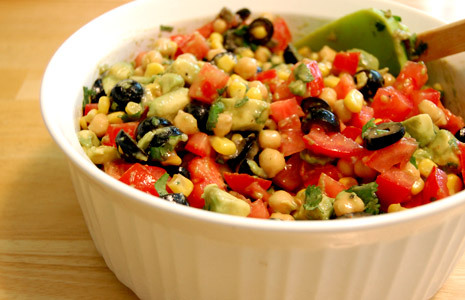 Drain corn and chickpeas. Mix all ingredients and salt to taste. I bet this would be delicious with black beans, too. This would also be great on jicama “chips,” on green salad, or wrapped in romaine or Boston/butter leaves like lettuce cups/burritos! This are all great ideas. I love jicama and agree that would be a much healthier alternative to tortilla chips. This looks great! Thanks for sharing the recipe.